The pilot Social Audit of National Social Assistant Programme (NSAP) schemes were audited from 08/04/2016 to 18/04/2016. The Social Audit covered 1 Gram Panchayat Units (G.P.Us), and 1 Urban Local Bodies (ULBs). Social audit Unit- Sikkim (VHAS) finalized the Social Audit Calendar to conduct Social Audit of National Social Assistance Programme schemes. Eight days was spent in Gram Panchayat (GPs) and Urban Local Bodies (ULBs) for document and beneficiaries’ verification, door to door verification and Gram Sabha/Jan Sunwai. Lastly Social Audit Unit- Sikkim prepared final Social Audit Report and submitted to the Social Justice, Empowerment and Welfare Department, Government of Sikkim (GoS). These villages are suggested to be covered for interventions where the basic access to health services is lacking for 20 000 population and the project has been named as Health on Wheels (HoW). The main target population is 0-6 year children, Pregnant and lactating mothers and Community. The project has been implemented from the month of July 2016. STRATEGY OF HoW: Provide quality primary health facilities and awareness among the community through mobile health clinic. Free OPD services for children. Free OPD services for mothers and expecting mothers. Free medicines for children under 6 years of age. Free consultation for needy individual. Free ambulance service for children under 6 years and mothers. Awareness camps for various health related issues. Anyone can receive the benefits but free medicines and ambulance services are provided only to children less than 6 years, expecting mothers and lactating mothers. Health worker: Miss Anita Rai. PICTURE GALLERY: Photos sent separately. Date: 15th march 2017, VHAS. VHAS has implemented the IIMK-Belgium supported project named as PARAS THEZUM in the seven villages of West Pendam Gram Panchayat Unit from 2001-2009 and the overall impact of the project seems successful. After the successful implementation of the PARAS THEZUM project in these villages of West Pendam area, VHAS shifted the focus to other area having similar kind of geographical and socio-economic background. The new area is Budang – Kameray Gram Panchayat Unit falls under Duga Block in East Sikkim, where around six villages are covered under community health and development project. The project has been given the name as PAKA project. PA for Pachak and Ka for Kameray as initially started with these two villages. 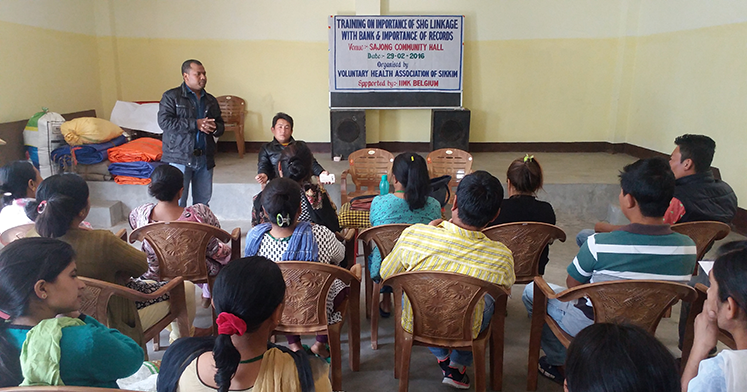 Under the RCH, awareness trainings have been given to the members of different SHGs of Sajong village under Budang Kameray GPU in East Sikkim from time to time. basically covering major topics as follows. Early registration of pregnancy with nearest Govt. health facility is a must to every pregnant woman. After delivery, PNC up to 42 days is important to see if there are any complications. Regarding Immunization, they were informed about the Immunization of pregnant women and children under National Immunization Schedule (India) where a pregnant woman has to get 2 TT injection and children have to be given immunization against 6 vaccine preventable diseases viz. BCG for prevention of childhood tuberculosis, D.P.T. for prevention of Diphtheria, Pertussis and Tetanus, OPV for prevention of Polio and Measles vaccine for prevention of Measles. Program Coordinator from VHAS, briefed the participants that their SHG should sustain in long run and all the SHGs have to plan their sustainability factor. Economic growth of all SHG leads to sustainability and all SHGs need to think what could contribute to economic growth. They should always make a plan for future and needs to think beyond the support from VHAS-IIMK or any other external agencies. The ultimate objective of sustainability should be self reliance. Support for Ginger: Samarpit SHG from Sajong have been supported for ginger farming as group economic activity. 10 members group have been supported with 10 mounds (400 Kg) of ginger and next year they have to give back 10 mounds of ginger to the project for rotation to other beneficiaries. 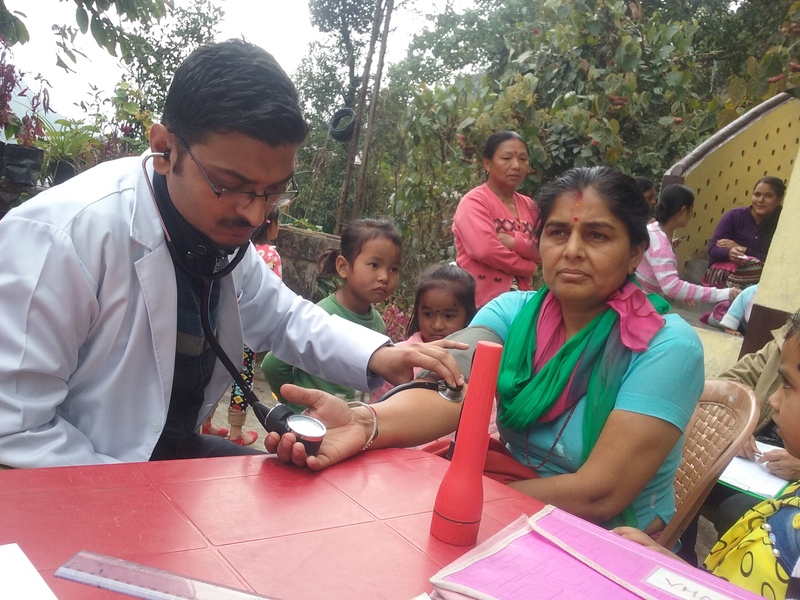 Voluntary Health Association of Sikkim (VHAS) has been making constant and concerted efforts to formulate and implement schemes to ensure adequate health care services to the people of the state, facilitated by the West Bengal Voluntary Health Association (WBVHA), Kolkata in line with National Health Mission. Under this endeavour attention is also being paid to take special care of the needs of the people of the tribal areas and backward regions. 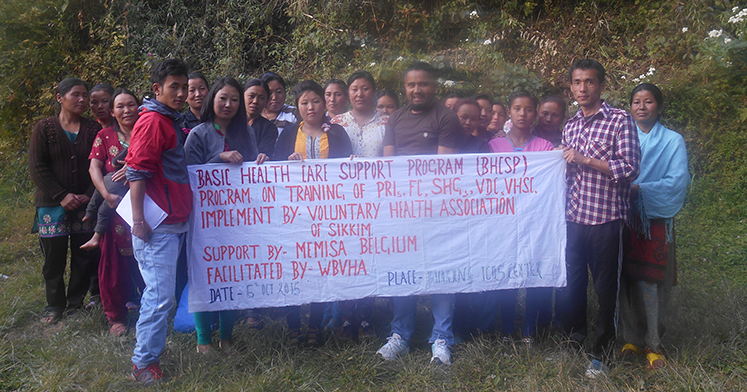 VHAS has implementing a dynamic program called the Basic Health Care and Support Program and ‘Block Health Consortium program’ with partners organisation at Sombarey block ,west Sikkim since 4 years. The program is aiming for better collaboration between very fragmented health’s providers. However, it is often stuck too much at the level of declaration of intention with little improvement of health services at field level. This program was integrated in the overall MEMISA-DGD-program from 2014. The purpose of the Consortium was to have a real impact on the services for the population in 21 villages directly or indirectly at 4 Gram Panchayat. Through regular workshop and perspective of the NGOs was widened and deepened and they started to collaborate among each other with the other health workers at the Panchayats, block and district levels. Tools such as the case-building exercise (concentrating on first line and second line services for specific cases identified as priorities basis such as maternal health) were very instrumental in moving forward. This first program resulted in improved services at community level with better coordination between the health factors at this level and a genuine dynamic for change. To improve the health care in 4 Gram Panchayat. To develop of a coherent and functional Panchayat and block health care system with the active involvement of all concerned stakeholders. To ensure effective implementation of NRHM and other health program in selected district, block and Panchayat/villages with active community involvement and participation. To identify the policy gaps in NRHM and other health programmes & to advocate for change in selected district, block and Panchayat/villages. Our team has observed a series of cases relating to the conditions of Public Health Centre, Community Health Centre, and the facilities in public hospitals. Due to legal interventions, the government ordered that blood donation facilities be made available and has given directions for a number of states to conduct inquiries into their public health system. The following areas are covered by VHAS under Basic Health Care & support Program through Partners. The basic objectives of the social audit is to ensure public accountability in the implementation of Projects, laws and policies. The Social Audit is an effective means for ensuring transparency, participation, consultation and accountability under the MGNREGA. The process of Social Audit combines people’s participation and monitoring with the requirements of the audit discipline. Since the agency implementing the scheme cannot itself audit the scheme, therefore, it is necessary to promote people’s participation in the audit along with support provided by an independent social audit organization that facilitates the process. The Social Audit process is not a fault finding, but a fact finding process. The work of the Auditor is only to ‘investigate’ by cross-verifying facts and details in the records from the laborers and cross verifying works at site. The “Auditors” must not view themselves as “Prosecutors”. Social Audit Unit needs to be establishes for the purpose of Social Audit by the state government. State Level Vigilance Cell followed district level and Vigilance and Monitoring Committee (VMC) at village level needs to be strengthen for the purpose of strengthen transparency. Maintaining of Proactive disclosure by gram Sabha, where all the details of works with bills, MR and Vouchers will be read out for the purpose of validation by Gram Sabha. Section 17 of Act clearly stated that, (1) The ‘Gram Sabha shall monitor the execution of works within the Gram Social audit of Panchayat. (2) The Gram Sabha shall conduct regular social audit of all the projects under the Scheme taken up within the Gram Panchayat. Rule 4 of Audit of Schemes Rules, 2011 stipulate that each state Government shall identified or established an independent organisation, Social Audit Unit (SAU) to facilitate conduct of the Social Audit of MGNREGS works. Voluntary Health Association of Sikkim has been identified by the Rural Management & Development Department, Government of Sikkim as the independent organisation to function as the Social Audit Unit (SAU) for conducting Social Audits of MGNREGS works in the state of Sikkim as per office order No.1122/RM&DD, dated 14.12.2011.VHAS has been facilitating the Social Audit for East and North of over 5 years since 2008.Over this year SAU has under gone for long process in collaboration with Rural Management & Development Department, Government of Sikkim to set up Social Audit Unit in the State. Dr. B.B Rai, Executive Director, VHAS has been appointed as Director for Social Audit Unit as per the letter Ref.No.496/RM&DD/MGNREGA,Dated:04/12/2012. After establishment of the Social Audit Unit, Sikkim and finalisation of the Sikkim Module of Social Audit, it was decided to conduct Social Audit in the State of Sikkim for the financial year 2013-14. All the DRIs had finalised the social audit calendar for the financial year 2013-14 and Social Audit Unit-Sikkim compiled the same. After the finalisation of the annual calendar for Social Audit same has been circulated to District Programme Coordinator (DPCs) and other implementing agencies during Kick off meeting at District level which was organised by DPC. Social Audit Started with conducting Kick off meeting at four districts of Sikkim before the actual start of Social Audit at Gram Panchayat. During kick off meeting Social Audit team circulated social audit calendar and clearly disseminated information about the process of social audit and required documents which social audit team will verify. With initiation of full flag Social Audit in the state from financial year 2013-14 same has been continued for 2014-15. Details as follows. 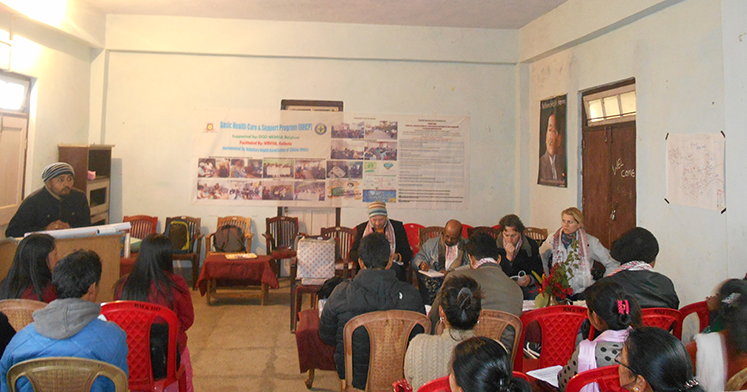 Social Audit Unit, Sikkim submits final Reports to RM&DD, C&AG Office, District, Block and Gram Panchayat. On monthly basis Social Audit Unit will prepared the Monthly Progress Report (MPR) of all the Action Taken Report received from District and submit to RM&DD and copy of the same is also send to C&AG office. In MPR issues raised are categorically compiled as summary for State, Block and followed by Gram Panchayat level. The Japan International Cooperation Agency (JICA) assisted Sikkim Bio-diversity Conservation & Forest Management Project (SBFP) is approved for implementation from 2010-11 and the implementing department of this project is the Department of Forest Environment & Wild life Management, Government of Sikkim. The project was covered in the four districts of Sikkim since 2011-12 financial years in the community level. In these four districts project covered total 135 JFMC/EDC and within these 3 year. 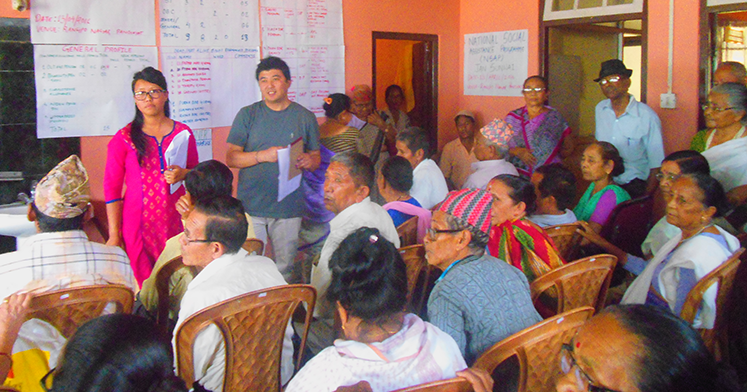 To improve livelihood for the local people who are dependent on forests by promoting sustainable biodiversity conservation, Afforestation and income generation activities including eco-tourism for the community development, thereby contributing environment conservation and harmonized socio-economic development of Sikkim. Eco-Tourism & Conservation Society of Sikkim (ECOSS) for the North district. The following activities have been proposed in the Project. Supporting Activities for Forest Management (Research and Training, Monitoring and Evaluation and Enhancement of Geographic Information System (GIS) and Management Information System (MIS). In the 5th year of this project Voluntary Health Association of Sikkim (VHAS) indentified 6 JFMCs and 5 EDCs under SBFP with the coordination of Project Management Unit and selected villages and details of JFMCs/EDCs are given below. At the end of the financial year 2015-16 Voluntary Health Association of Sikkim (VHAS) initiated meetings with selected 56 SHGs under JICA assisted Sikkim Bio-diversity Conservation & Forest Management Project (SBFP) for their performance grading to provide loan from SBFP and also representative of VHAS attended the trainings and programmes which was organized by Project Management Unit of SBFP. The survey was done by 2 teams comprising of 2 members in each team. This way 2 villages were covered in a day, thus total of 8 villages were covered by 2 teams in 4 days. Both the group had 1 male and 1 female member. The idea behind keeping 1 female surveyor per group was to make conducive environment for village women to interact openly with the team. During the need assessment survey of 8 different villages, rampant prevalence of Non Communicable Diseases was found. There are issues of social problems as well. In one of the villages, Amba-Taksang, people shared that the case of Suicide is high and have asked for immediate mental health program focussing on prevention of suicide. There are accessibility problems due to conditions like difficult terrain, improper road connectivity, unavailability of public transport in frequent basis, low economic condition, and cut off due to landslide during monsoons in most of the villages. There is a vast scope for implementation of awareness campaigns and health camps in these villages as lifestyle related diseases like diabetes and hypertension are reported from most of the villages. The necessity of School Health Programs has also been felt as in almost all schools, Student-Toilet Ratio is not sufficient. Awareness on importance of health and hygiene at School is necessary. VHAS is planning to establish good hospital in the state of Sikkim. The ambulance was donated on 18th march 2012 to VHAS by Mr. A. Krishna Kumar, Managing Director, National Banking Group, SBI corporate Centre Mumbai contributed for this future plan of VHAS. VHAS has been working with the people of grass root level on health and social issues and was highly appreciated on the work done by VHAS and also encourages VHAS to work more for the people on health issues. Now the ambulance is working for the good cause. The ambulance was also used during Nepal earthquake for disasters relief.